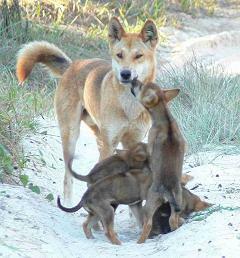 Where do Dingoes Come From, What do They Eat, and Do Dingoes Really Eat Babies? Dingoes are wild dogs native to Australia the size of English setters, and hunt wallabies, sheep, rabbits, and anything else they can catch and drag away. In 1998 a dingo was accused of dragging a baby a few feet toward the bush before being chased away by the infant’s parents. In a celebrated murder case in 1980, the parents claimed that it was really a dingo that killed their baby. In real life, the parents were first convicted of the murder and then cleared on appeal, but whether a dingo was really involved has never been formally resolved. So the short answer is that dingoes probably could drag away a baby and eat parts of it, but it has not been proven that they ever have. Do all Kangaroos and Marsupials have Pouches for Babies to Live and Hide until they are Old Enough to Leave? Where Did the Myth That the Stork Delivered Babies Come From and How Did it Originate?